Men should be prepared to balance out the navy, browns, and whites of this spring with bold brights and fresh styles. While the more daring looks of the runway may seem intimidating, the basic trends can easily be integrated into every man’s closet. No longer simply for a nautical feel or for the Fourth of July, along with the women’s fashion trend this season, stripes will also be more prevalent for men. Bold patterns make an appearance as well for the spring. 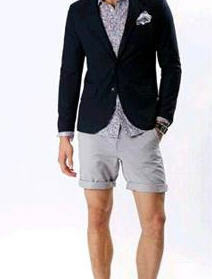 The blazers and shorts look was popular, adding some flair and sophistication to a casual look. Bright colors were an important trend for this season, featuring dusk blue, poppy red, lemon zest, and nectarine as some of the biggest hits. Whether expressed boldly through larger garments or simply added through the splash of an accessory, don’t miss out on these fresh new colors. Tom Ford has replaced the classic black suit or tux with navy, continuing to provide a classic look with a bit of a new edge. Different shades of browns are prominent this season, helpful to soothe out the bright colors of the season. And of course, white continues to be a crisp and classic favorite.